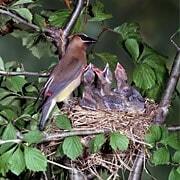 The Cedar Waxwing is a here today gone tomorrow type of bird. A flock of these birds may descend on a fruiting crab apple tree passing ripe fruit from one bird to the other. This cooperative feeding is worth watching as the waxwings make their high pitched calls the whole time. When the fruit is gone, so are the birds. Watch them while you can. The following information by Eldon Greij will give you more information on the habits of these birds. The sleek and handsome Cedar Waxwing is one of the most welcome avian visitors. Its silky plumage sometimes defies seeing individual feathers. The striking head sports an elongate crest with a black face mask and the generally brown and gray plumage has a black chin-throat and a soft yellow belly. The cedar waxwing has a western cousin, the Bohemian waxwing, which has a similar plumage but is gray on the belly, rusty under the tail and has small white and yellow markings in the wings. Both have a yellow terminal tail bar. The yellow color results from the pigment carotene that is produced by plants and taken in when feeding. In recent years, waxwings with orange terminal tail bars have appeared because the birds have fed on exotic honeysuckle fruits which have a different carotene pigment. Waxwing Red Tips Another unusual plumage marker is the red waxy tips on the ends of the inner wing feathers, the secondaries. The function of these red tips is not clear, but they are more common on older birds. Birds with red-tipped secondaries breed earlier than those without and generally rear more young. Red tips, therefore, probably are important signals for mate selection, functioning as "badges" to designate fitness of individual birds. Waxwings are very social and usually travel in flocks. Rarely does one see a single bird. Their high-pitched twittering is a dead give away for those with fine-tuned hearing. 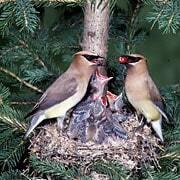 The Cedar Waxwing eats about 80% fruit. They were named cedar waxwings because of their strong attraction to the red cedar tree (actually a juniper) with its sweet blue fruits. As the supply of slow-growing red cedars dwindled due to their value as fence posts, storage chests, and the main wood for pencils, waxwing diets became more varied. They typically feed near the tips of fruit-bearing branches --- often hanging upside down to pluck favorites such as cherries, crabapples and hawthorn fruits which are high in sugar content. Waxwings are susceptible to intoxication, especially when several warm days follow a cold frost. The cold causes cells in the fruit to burst, and yeast works on the mash converting sugar to alcohol. There are numerous records of birds flying out of control from the effects of alcohol. Sometimes, when waxwings are lined up on a branch, the bird nearest the fruit cluster will pass fruit to its neighbor, which in turn, may pass it on down the line. Raisins and small pieces of chopped apple may bring waxwings to feeders. Waxwings nest later in summer than most backyard birds. The reason they nest late is that they synchronize hatching with fruit development. Both sexes bring nest material but females do most of the nest building, lay 4 or 5 pale blue or blue-gray eggs with black or gray blotches and incubate them for 12 days. Nestlings spend another 13 days in the nest before fledging. 1 - 2 broods raised. Waxwings breed across North America from the lower tier of Canadian provinces south to the northern gulf states. Their primary wintering site is in the southern U.S., but the species is nomadic and irruptive. Consequently they can be found anyplace in the United States and sometimes as far south as Costa Rica during the winter. Typically waxwings gather for fall migration in August, although some will wait as long as October before migrating. Keep your eyes on the neighborhood fruit trees. Regardless of the time of year, a flock of cedar waxwings can drop in at any moment.